The column is topped by a bust of Emilio Vázquez Gómez. 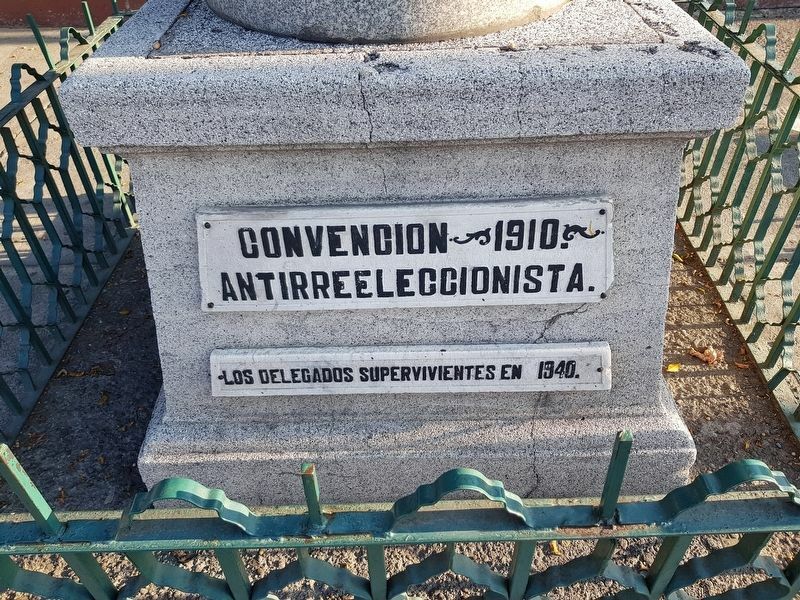 En memoria de la Convencion Antirreeleccionista del Tivoli. 15 de abril de 1910. A iniciativa de la vieja guardia revolucionaria de 1910. Erige esta columna el Departamento del Distrito Federal. MCMXXXIII. Convención – 1910. – Antirreeleccionista. Los delegados supervivientes en 1940. In memory of the Tivoli Anti-reelection Convention, April 15, 1910, on the initiative of the revolutionary old guard of 1910. This column is erected by the Department of the Federal District, 1933. The surviving delegates of 1940. Erected 1933 by La Vieja Guardia Revolucionaria de 1910. This additional inscription is on the front base of the column. Cosme and Avenida Insurgentes Norte, on the right when traveling west on Avenida Ribera de San Cosme. Touch for map. 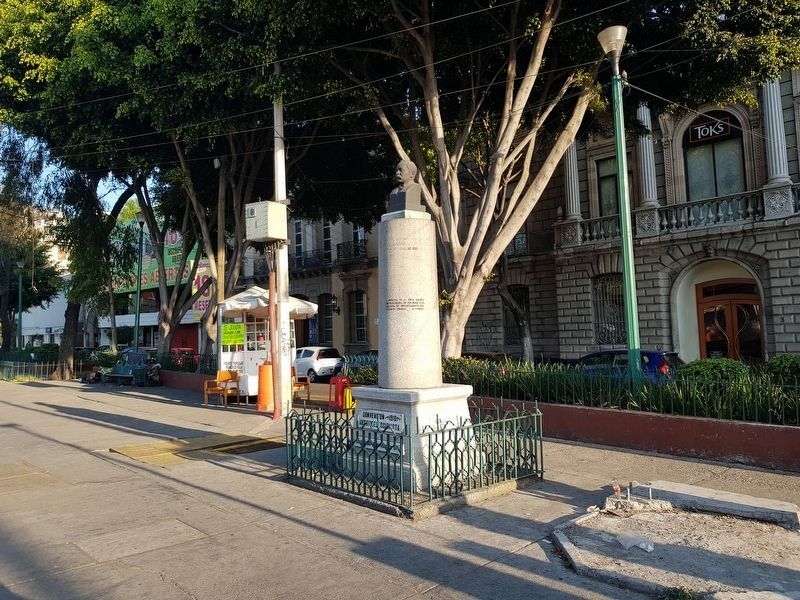 Marker is in this post office area: Ciudad de Mexico, Ciudad de México 06400, Mexico. Touch for directions. Other nearby markers. At least 8 other markers are within walking distance of this marker. Valentín Gómez Farías (approx. 0.4 kilometers away); House of the Marqués de Buenavista (approx. 0.4 kilometers away); Tragedy at the Lobohombo Disco (approx. 0.6 kilometers away); Nicolás García de San Vicente (approx. 0.7 kilometers away); General Ignacio Pesqueira (approx. 0.7 kilometers away); Manuel Cepeda Peraza (approx. 0.7 kilometers away); Juan Zuazua (approx. 0.8 kilometers away); Julián Villagrán (approx. 0.8 kilometers away). Touch for a list and map of all markers in Ciudad de Mexico. Regarding The Anti-reelection Convention of April 1910. 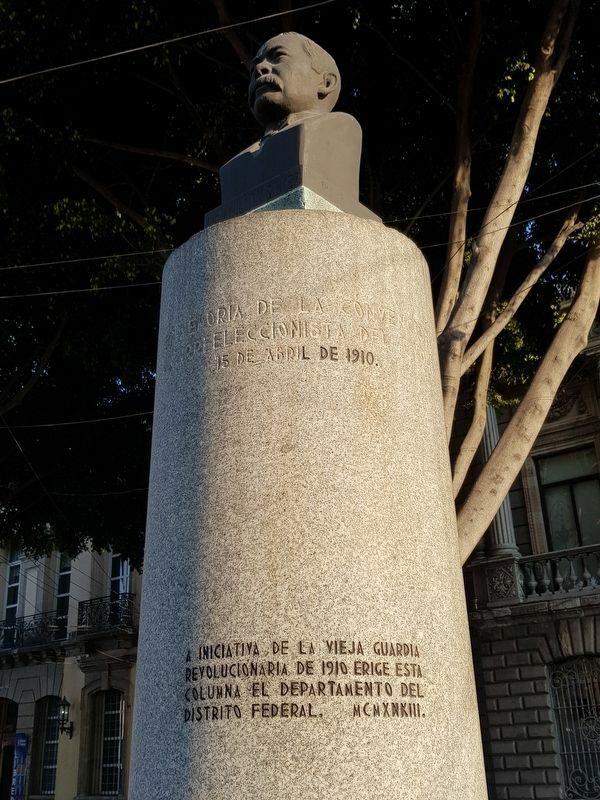 This marker and column memorializes the Mexican Anti-reelection Convention of April 15-17, 1910, where it was decided that Francisco I. Madero would contend with Porfirio Díaz for the presidency in the 1910 elections. 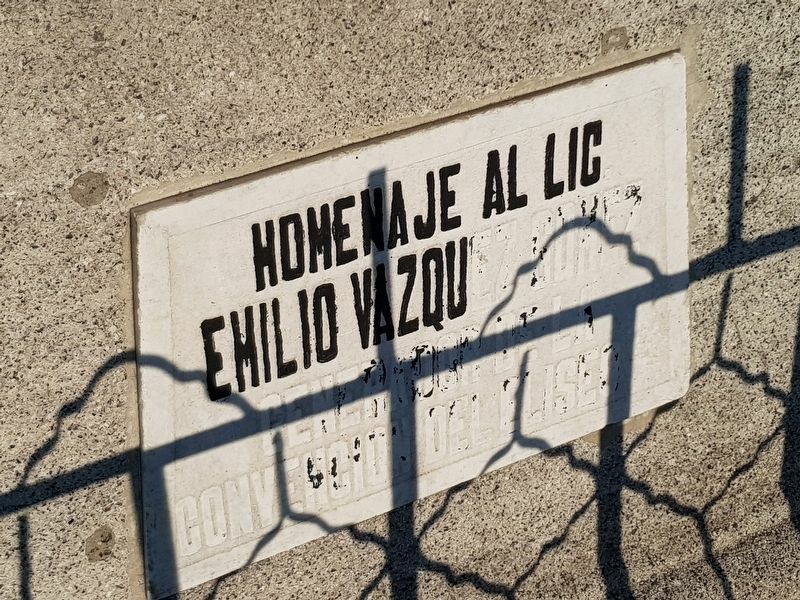 The convention was held at the Tívoli de Eliseo, a garden and public meeting space, previously nearby this memorial but since removed due to new construction in the area. This additional inscription is on the right side of the base of the column. the 1910 elections, with Vázquez Gómez soon leaving Mexico. More. Search the internet for The Anti-reelection Convention of April 1910. Credits. This page was last revised on March 1, 2019. This page originally submitted on March 1, 2019, by J. Makali Bruton of Querétaro, Mexico. This page has been viewed 40 times since then. Photos: 1, 2, 3, 4. submitted on March 1, 2019, by J. Makali Bruton of Querétaro, Mexico.